During the First World War, the Second World War and the Korean War, Métis from across the Métis Nation enlisted in the Canadian military in large numbers. Unfortunately, we don’t have exact enlistment figures for these Métis soldiers because they were not allowed to self-identify as Métis. This especially bothered Claude Adams of St. Louis, Sask., who was a member of the 1st Special Service Force, a joint Canadian-American force known colloquially as the Devil’s Brigade. In military records, soldiers were categorized as either Treaty Indians (First Nations) or by their European ethnicities, with no category for Métis. The Métis enlisted in these wars for a variety of reasons, including patriotism. By enlisting, many escaped grinding poverty in their road allowance or northern bush communities, and many young enlisters were also following a sense of adventure. Traditional Métis skills such as trapping, hunting, scouting and guiding were in high demand by the military and made the Métis very successful soldiers. While their men went to war, many Métis women worked on traplines or did other work to support their families.
. . . today there are no more staunch upholders of the rights of Canada than the Métis, and many are those of the younger generation who have laid down their lives for King and Country during the late war. Lloyd Hamilton served in the Korean War. 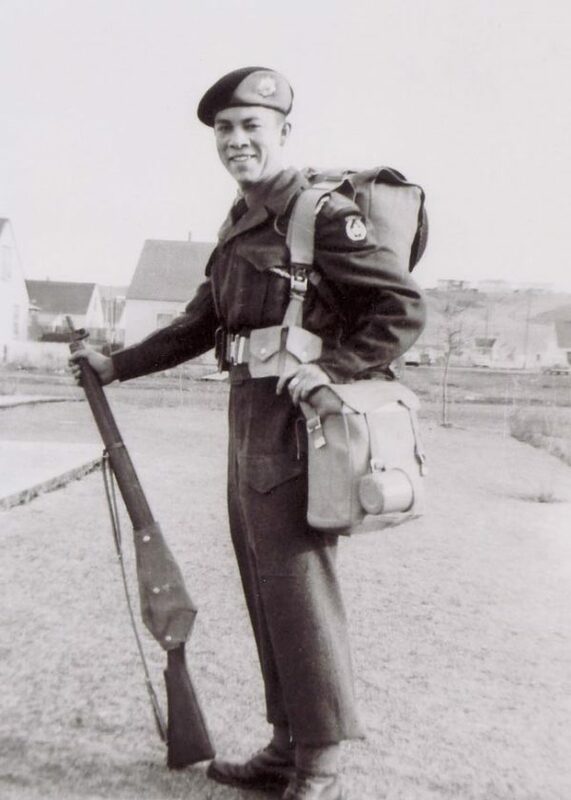 Lloyd Hamilton, the great-grandson (through adoption) of Gabriel Dumont, served in the Canadian Army during the Korean War. On one occasion, Hamilton worked with an American soldier to save 80 Korean children in an orphanage who were caught in the Korean Demilitarized Zone. For this action, Hamilton received a medal from the United Nations. Following the Second World War, many Métis veterans would become political leaders and activists, particularly within the Métis Society of Saskatchewan, founding Indian and Métis Friendship Centres and Legion branches. Métis veterans were often unable to obtain their veterans’ benefits after their military service, and their struggle for restitution continues to this day. Various organizations within the Métis Nation built the National Métis Veterans Monument to honour Métis veterans from across the Métis Nation Homeland. Located in Batoche, Sask., the monument includes the names of almost all the Métis veterans who have served Canada until the present. During the War of 1812, Indigenous peoples, including the Métis, played key roles as allies of the British and Upper and Lower Canadians. Almost all Indigenous peoples in the Great Lakes basin and in Upper and Lower Canada were loyal to the British Crown and fought with British regulars and the British North American colonial militias to resist the American invaders. British and colonial authorities actively encouraged alliances with Indigenous peoples since the Americans vastly outnumbered the British American colonists. The Métis were loyal to the Crown during the War of 1812, and they used their First Nations, familial, military and fur trade relationships to organize resistance to the American invasion of Upper and Lower Canada. Some Métis helped repel American invaders in key battles such as those at Detroit, Queenston Heights, Lundy’s Lane, Fort Mackinac, Frenchtown (Raisin River), and Prairie du Chien. Métis warriors served in the North West Company’s Corps of Canadian Voyageurs, William Caldwell’s Western Rangers, the Michigan Fencibles and the Mississippi Volunteers. Many of the Métis who fought in the War of 1812 either had roots in what is now Western Canada or would soon move there following the war’s conclusion in 1814. The direct descendants of these Métis warriors include the Dease, Ducharme, Fisher, McGillivray, Nolin, Pambrun, Ranville, Revard, Rolette and Sayers families. 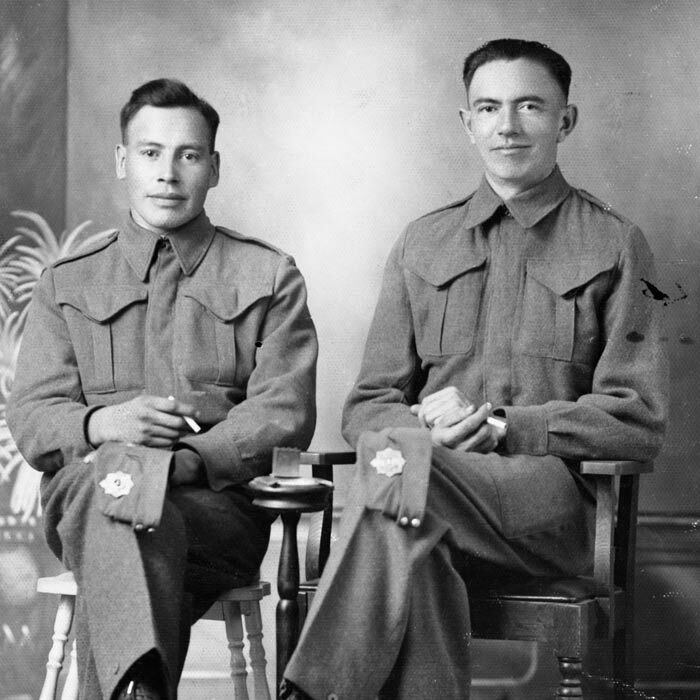 J.P. Flammond and James G. Poitras served in the Second World War. One of the fortunate results of this bloody war has been a 200-year peace between the United States and the British North American colonies, and their successor state, Canada. However, this long peace also meant that British and Canadian officials no longer needed Indigenous peoples as allies. As a result, oppression soon followed and included the Province of Canada’s stridently racist Indigenous policies in the 1850s, which were later consolidated in the 1876 Indian Act.